Missouri S&T’s St. Pat’s Celebration Committee will reveal the 2016 sweatshirt design at a ceremony this afternoon (Friday, Oct. 23). The event will take place at 3:30 p.m. on the north side parking lot of University Book and Supply, 12th and Pine streets in downtown Rolla. The ceremony will also include the reveal of the 2016 button design and the announcement of the celebration’s parade and coronation theme. Members of the St. Pat’s committee, campus and the community will speak about the history of the celebration, its merchandise and its importance in the campus and Rolla community. This event kicks off the sales season for 108th Annual St. Pat’s Celebration. The sweatshirts, buttons and a variety of other merchandise is sold throughout Rolla to raise funds for the celebration. 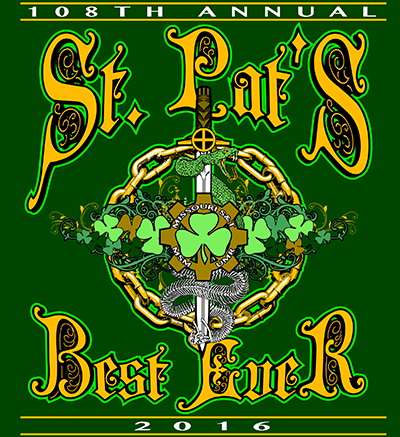 Festivities start with the election of the St. Pat’s Court on Thursday, March 10, 2016, and conclude with the St. Pat’s Parade, concert and Grateful Board Festival on Saturday, March 19, 2016. Both the sweatshirt and button will be available for sale at the conclusion of the ceremony. For more information, please contact John Ziegler, St. Pat’s sales manager, at jhzm94@mst.edu.